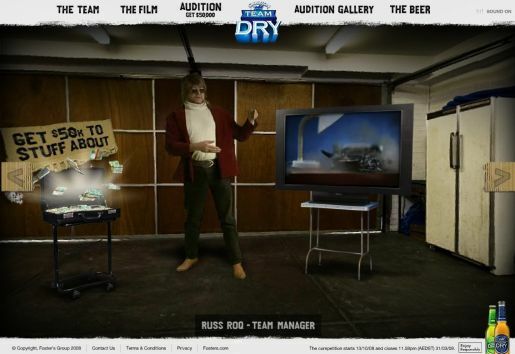 Carlton Team Dry, today’s site of the day, features a competition sponsored by Foster’s Carlton Dry beer in Australia, opening on October 13 and closing on March 31, 2009. Four young men, Angus The Bicep Dancer, The Jumpers and Ping Pong Don, demonstrate their skills to show that anyone can try out for a year of being sponsored to do dumb stuff full time. Fosters Australia is working on the hunch that the stupid things guys do in their early twenties are probably the most fun things they’ll ever do. To communicate the idea, we have Team Dry, a team of professional misfits with bizarre, meaningless skills, led by team manager Russ Roq. TEAM DRY the site launches with a 10-min team film, ‘Tokyo Blitz’, featuring profiles and a team trip to Tokyo. The clip is designed to show prospective entrants the mixture of stupidity and brilliance required in their video entry. Apparently Pay TV channels have already shown interest in broadcast the film as branded entertainment. The site includes wallpapers, screensavers, short film clips featuring the present Team Dry. Visitors are invited to upload their auditions to The Gallery, to join 12 finger Jake’s Super Cube, Sarah’s Kung Fu Eyebrows, and Winking by Ryan. Here’s the Duelling Biceps video, subtly placed in the YouTube environment. The Team Dry site is being promoted by two 30 second commercials on air and on YouTube, as well as point of sale screens, print, on-pack and web advertising. Over 100,000 TEAM DRY ‘Tokyo Blitz’ DVDs (with special features) will also be given away with cartons of Carlton Dry. The Team Dry campaign was developed at Clemenger BBDO, Melbourne, by executive creative director James McGrath, creative director Ant Keogh, creative team Cameron Harris and Seymour Pope, agency producer Sevda Cemo, typographers Musonda Katonga and Ryan Fitzgerald, interactive creative director Damian Royce, interactive art director James Reiley, multimedia designer Calvin Teoh, interactive producer Sam Hodgson, strategic planner Mike Derepas, account directors Paul McMillan and Phil Baker. Filming was shot by director Miki Magasiva via Curious Film, with director of photography Adam Clarke, producers Sarah Cook and Matt Noonan, animators Syd Garron and Johannes Gamble (Superstudio). Editor was Peter Sciberras at The Butchery. Post production was done at Mike Reed Partners Post Production (MRPPP). Sound was designed by Paul LeCouteur at Flagstaff Studios. Several music tracks were sourced by Level Two Music.